This is the perfect first project. You can use any kind of yarn. If you use a thick yarn and large needles it will be done in no time. If you use one of the new novelty yarns with lots of texture it will look like a masterpiece. The people at your local yarn shop will be happy to help you chose the right yarn and needles and get started. Usually a scarf is about 6 to 8" wide so cast on as many stitches as it takes to make that width (or however wide you would like your scarf to be). Knit every row, which makes a pattern of ridges known as garter stitch. Both sides (the back and front) will look the same . Cast off when you've made it as long as you want. 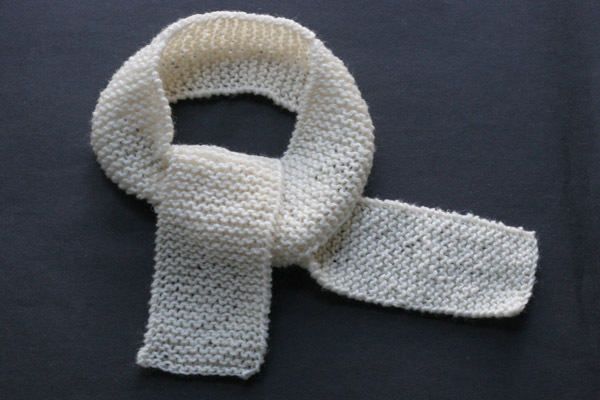 This scarf can be used for a small wrap to keep your neck warm, or for a baby. TIP: if you make it for a baby it will be smaller and go faster.